The benchmark for every graduate is to have their college take a stand at New Designers, but this requires commitment, cash and perfectly made pieces. Hardly surprising, then, that for some of the smaller colleges, which have been struggling of late to fill their furniture-making courses, this remains a dream. But watch these pages in two years' time, because if Leeds College of Art & Design doesn't have a stand at the London show it won't be for want of trying. 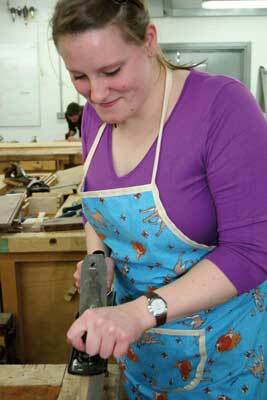 Having offered HNDs for years, the college entered the degree arena in 2005 with a foundation degree in furniture making and a route to a BA via an associated course in furniture making that next year changes to give graduates a BA Hons in 3D Design (Furniture). Course leader Richard Jones said: "We have rewritten the curriculum completely so there's a direct route through to the third year BA top up." What this means is students will spend the first two years on technique and the third on design. Woven through the courses are modules with a focus on business and economics. "The foundation course has design content but the BA Hons furniture programme is design-led, enabling graduates to design, develop and work to a brief, with the ability to run a job and deliver it to the client. There is much emphasis throughout on personal development and students presenting objectives. He said: "Of this year's first years I have one student who wants to build a website, another wants to look in depth at Charles Rennie Mackintosh and another wants to study wood-bending techniques. You can see where taking on these ideas benefits students and its relevance to the future." He added: "Students are kept on a pretty tight rein for the first two terms to get into their heads the basic skills they'll need for the rest of the course." In the second year the focus is on batch and mass production, about working to price and opening up students' eyes to the possibility of making other than high-end furniture. "We try to make students aware of all the different strands they can do apart from fancy furniture made in a thatched barn somewhere," Richard explained. At Leeds don't expect to be spoonfed. While the college teaches the basics, students are expected to research the more complex techniques as part of their personal learning, in so doing earning extra marks for pushing their personal envelopes, so I suppose I shouldn't have been surprised to see one student concentrating furiously as he painstakingly worked out how to cut houndstooth dovetails only eight weeks or so into the course. It's no easy ride either. Richard said: "I, personally, am strict and the college is fairly strict. Deadlines are fixed." The only excuses for late work are certificated illness or serious personal circumstances. "Sniffles are no excuse," he said. 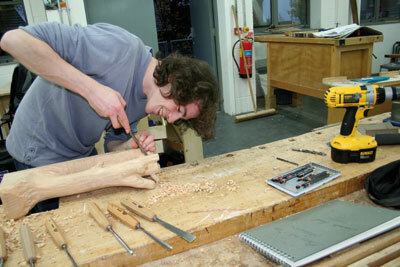 The third year is set up so students can build up a body of high-level work with which to impress the outside world. 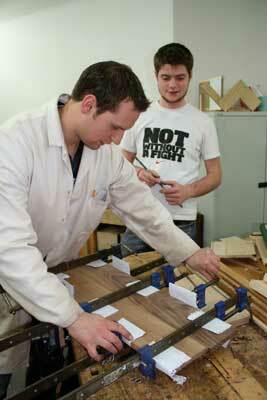 The courses attract a high proportion of mature students, and ages range on the current year's intake from 20 to 43. "I get quite a few career changers who don't want to do the third year," said Richard. Each foundation year costs about ï¿½3,100 in fees and a bit more for the final year. 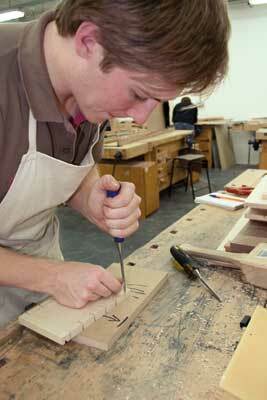 The courses run to a maximum of 18 and each student is virtually guaranteed his or her own workbench. This year 14 first years began and you only have to gaze over the workshop to sense the fizz between them that is exciting Richard. "We've never done New Designers. Perhaps we will in 2010," he said. "Students come in on days when they are not being taught, and work. This group of first years has a real spark." Head of the School of Art & Design, Simon Thorpe, leapt to the challenge: "There's no reason why we shouldn't be able to do New Designers then." He added that an interest in furniture making had been rekindled. "The reason why there is a demand for craft courses is that the curriculum at school level has changed completely with an over reliance on computer technology." He was concerned that children were taught very little in the way of observational drawing. "There's no gain without pain in the craft industry and a lot of students haven't been exposed to that pain, only to pressing a button for a quick-fix solution. "Crafts generally are an endangered species. We have some really well-equipped workshops here and we want to hang on to woodwork skills and furniture making is ideal for maintaining that. 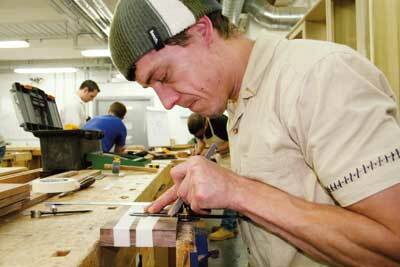 Furniture making is skills based and we want to teach students to think for themselves." There are no quick-fix solutions on offer at Leeds. Instead you get workshops kitted out with all the tools and machines you are likely to need, the advantage of a tutor who also runs his own workshop and has a long history of making his own living designing and building furniture, and oodles of encouragement. So here's the challenge to the second years: let's see you and your work at New Designers 2010! 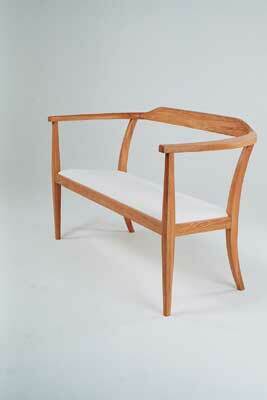 "I had a background in making reproduction furniture, then I came to train in contemporary and design. I had some experience working with youngsters. When I finished the course there was a space here. I'm working towards a Certificate in Education and am currently sharing a workshop with another guy. 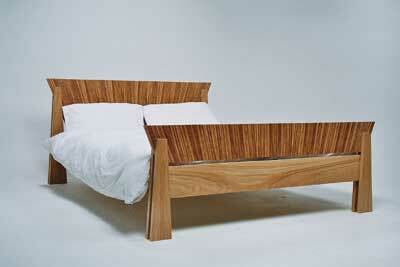 I'm hoping to develop a range of hall furniture." "I left school at 14. I went to college for two years doing IT, then worked as a site joiner but wanted to do something a bit more creative. I chose Leeds over four other colleges and on my first day I felt I'd made the right decision. As the weeks have gone by I've thought that more and more. Richard's really good, strict but fair, and I'm impressed with the teaching staff. There's a good atmosphere and varying age range. Everyone's getting on and making the best we can. We all benefit from each other. I'm hoping to do three years. I'd really like to have my own business, after a few years in industry maybe." "I was previously doing chemistry but one day had this epiphany and wanted to do something hands on. I stumbled on this course on the college website and thought it's for me. I'm really enjoying it. I like the practical aspect of it. The whole course is put together in such a way that even if you don't want to do woodwork there's plenty more in it, AutoCAD for instance. 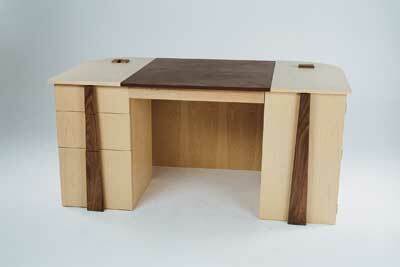 I would like to carry on making furniture." "I used to work at welding. I wanted to do something really creative. This is an absolutely fantastic course, really challenging. 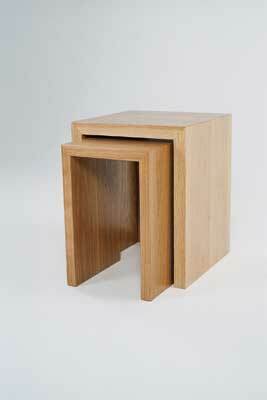 I look forward to doing my own furniture." 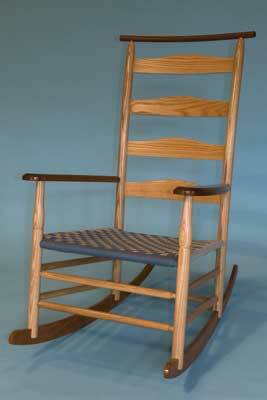 "My father is an antiques dealer so I'd been brought up with wood and knew I wanted to do something creative. I'm really happy here. It's tough work but I like it that you go straight in and all marks count. I've been to other universities where students doss around. I'm hopefully here for three years then I want to go into bespoke cabinet making in London where the money is." "While the college teaches the basics, students are expected to research the more complex techniques as part of their personal learning"